Players of Bashundhara Group Taekwon-Do Team celebrate with the trophy of ‘4th Bangladesh Cup Taekwon-Do Competition’ at Shaheed Suhrawardy National Indoor Stadium in the capital on Monday. 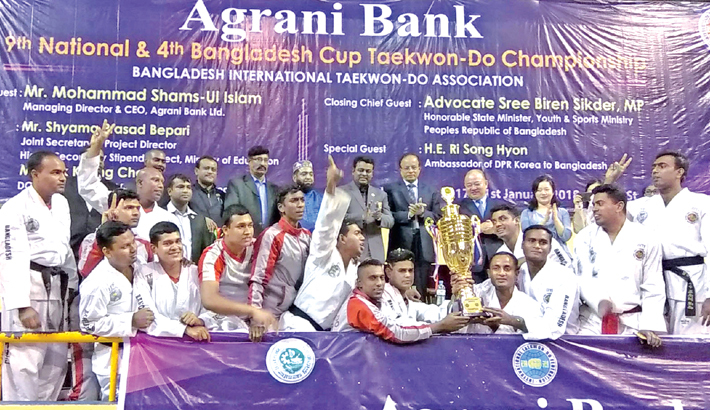 Bashundhara Group Taekwon-Do Team won the title of the men’s event of ‘4th Bangladesh Cup Taekwon-Do Competition’, organised by Bangladesh International Taekwon-Do Association at Shaheed Suhrawardy National Indoor Stadium in the capital on Monday. The four-day meet was sponsored by Agrani Bank. Central Taekwon-Do Academy became the runners-up in the men’s event while Agrani Bank were titled the champions in the women’s event. In addition to that, Bashundhara Group also emerged as the champions of ‘9th National Taekwon-Do Competition’ on Sunday as Central Taekwon-Do Academy became the runners-up in the same event. 150 players participated in the event in 25 groups. The teams were split into four divisions according to 21-weight categories. Bangladesh Krishi Bank Chairman Mohammed Ismail chaired the prize giving ceremony of both the tournaments as the chief guest on Monday and distributed the prizes among the winners. Among others, North Korea Deputy Chief of Mission of Bangladesh Pak Kyung-Chul was present as special guest while Bangladesh International Taekwon-Do Assoaciation President Solaiman Sikder, tournament committee chairman Mohammad Shahjahan Ali were present on the occasion. Following the prize giving ceremony of the meet, 20th World Taekwon-Do Championship bronze medal winner Santa Rani Roy was awarded with a crest.